We often hear about the weakest link. A chain is only as strong as its weakest link. If there are 10,000 links on a chain but one is weak, then the entire chain is only as strong as that weak link. When that link breaks the entire chain is broken. In the gym we must look at the hanging punching bags, find the weakest link and see how it is holding up. If it is at risk of breaking we must replace it. Such is the nature of the weakest link. This is true and a "truism". With Krav Maga it is different. Many, most, martial arts focus on the strong, those with championship ability, Olympic ability, those who can "bring home the gold". Many boot-camp programs are designed to "weed out the weak". The weak members will be dropped, only the strong survive. But this is not the tradition of Israel, this is not the way of the Jewish people. We are the descendants of Yaakov, Jacob, and not of his brother Esau. While the camp of Esau included only seasoned warriors the camp of Yaakov/Jacob included women, pregnant women, and children. During World War Two the Bielski camp in the forests of Belorussia included not only partisan fighters but old people, non combatants, young women and children of all ages. All were equally important. 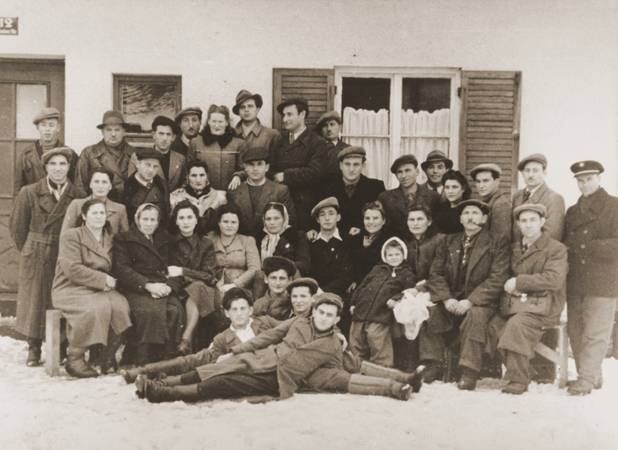 A few of the more than 1,200 members of the Bielski group that survived the Holocaust. The Jewish community has always stressed that it is not for the elite alone but for all. This is not a race of "superior beings" but a community were all are welcomed; the young, the old, the psychically and mentally handicapped. Sadly, most Krav Maga instructors these days have broken with this age old Jewish tradition. They have adopted more of the "Superior race" mentality. They want only the strong and young, the athletic and fit. There is no place for fat people, no place for imperfection. Their Krav Maga style requires strength and speed, fitness and coordination. These are all great qualities but most of us have those in short supply. This attitude eliminates the vast majority of society, the vast majority of people that truly need to learn to defend themselves. We see those instructors, they grunt and shout, they pride themselves on bruises and injuries, they call it "real" Krav Maga, it is not. For us at IKI Krav Maga, the weak link is actually the strongest. For the weak link is the ultimate test of a technique. It does not greatly interest me that a combat veteran, a battle hardened soldier, can pull of a technique. I want to see a young woman do it, or a short fat woman with small hands. I want to see the "soft" Jacob do the technique, not only the muscular Esau. That is our way. This is the true test of a technique. This is what it takes for a technique to be included in IKI Krav Maga. The weak link is the strongest because that is how we test and evaluate a technique. This is how we judge technique at IKI, we train with true Jewish values, not Spartan or "supreme race" values. Most of the techniques taught by the Esau school of thought, the tough guy techniques, will not work for most people. Those techniques are actually weak because they have not been tested and approved by the weakest link. Thus we say that the weakest link is the strongest as it makes the techniques that much more effective. It refines and distills our training to the most basic, natural, simple effective and useful techniques. This is IKI Krav Maga.